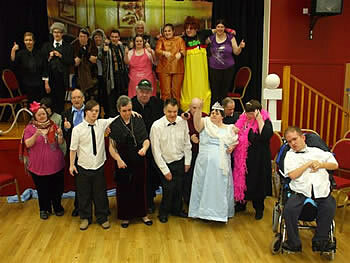 TAG (The Acting Group), is a local drama group for adults with learning disabilities and has been running now for just over three years. It was started up by Southampton Day Services in response to lots of enquiries from service users in the city and we took over the running of the group back in 2010 and it has grown very popular! The group meets each Monday evening at Freemantle Community Centre where we share refreshments together before spending an hour working on drama, music and dance ready for our productions. The group stage two shows each year (Summer and Winter) and always attract a good audience along in support of their efforts. Past productions include ‘Swifter, Stronger, Higher’ (an Olympic play), Oscars Movie Night, Cinderella and A Christmas Carol. please contact neil@e-quiparts.org.uk or call 07737 287 152.